Few ground covers can match Japanese pachysandra (Pachysandra terminalis) for toughness and versatility. A shrubby evergreen that's about 8 inches tall, it grows as a dense, green carpet that spreads to cover areas in partial or total shade. It's a vigorous grower. 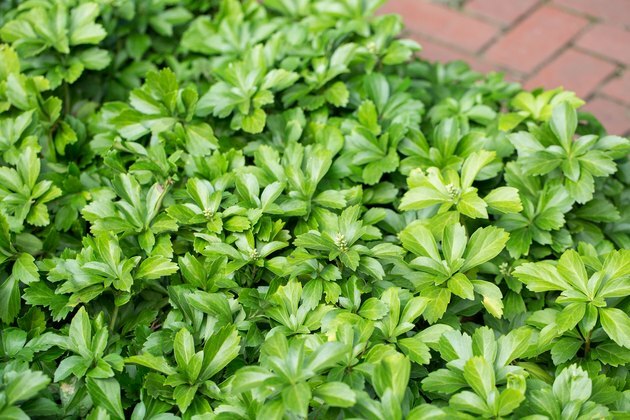 So if you have a patch of pachysandra and want to start a planting of it in another spot, transplanting clumps of the pachysandra is a simple way to achieve that goal. Although Japanese pachysandra can be transplanted any time during its growing season, it's best to move the plant in early spring, when it's poised to put out new growth. It also transplants successfully later in spring and in early summer but when the weather is cool, and not during a dry, hot period. Don't transplant pachysandra in fall, because new growth that develops shortly after the move could be injured by winter's cold. 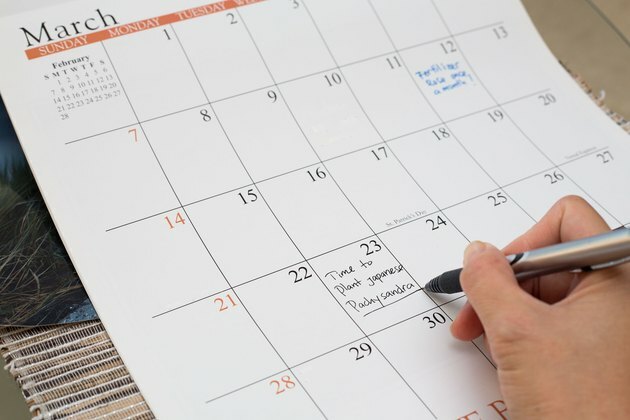 If it's fall when you decide to start a new pachysandra planting, spend some time preparing the new site, and delay the move until the following spring. Using a sharp spade to dig up each pachysandra transplant is the best practice, cutting around a clump of stems and scooping under the clump with the spade to dislodge roots before lifting the clump. Pachysandra spreads by underground stems, or rhizomes, that develop roots as they grow. Loosen all of them spreading outward from the clump, and then cut them, keeping them with the clump as you move it. 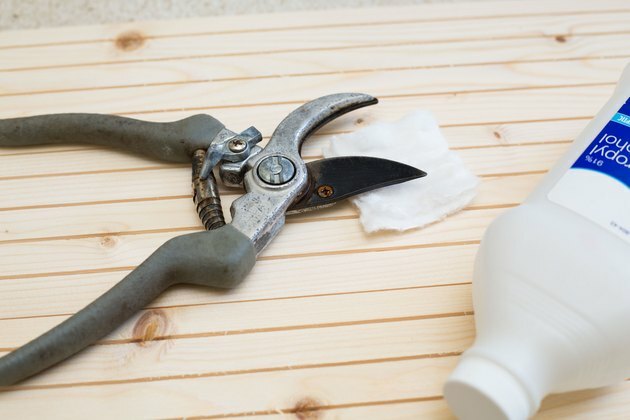 Disinfecting your tools between cuts by wiping them with rubbing alcohol will help prevent the spread of plant diseases. Pachysandra grows best in soil rich in organic matter. So prepare the new planting site by mixing compost into the top 4 to 6 inches of its soil, breaking all soil clumps and turning the soil well. Dig a hole for each pachysandra clump, and plant each clump at the same soil depth at which it was planted in the old site. After the remainder of each hole is filled with soil, the soil should be tamped well. 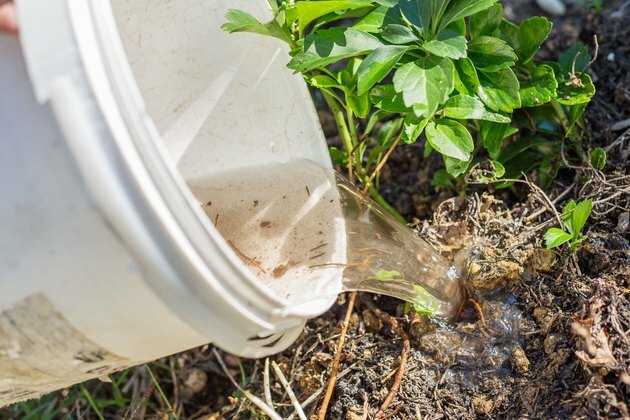 Drench the soil around each transplant to get rid of air pockets around the roots. If you move several plants, then space them 6 to 12 inches apart to allow room for their new growth. Transplanted pachysandra plants need their site to remain well-watered, with about 1 inch of water weekly, including rainfall. 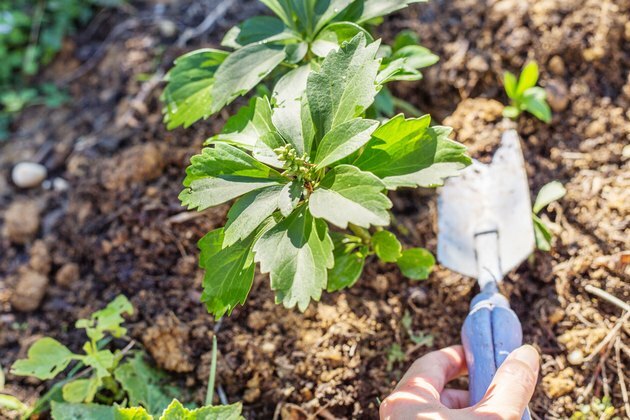 Add a 3- or 4-inch-thick layer of organic mulch on the soil surface around each plant -- but not touching the plants -- to help conserve soil moisture while keeping down weeds, which compete for water and soil nutrients. Japanese pachysandra is hardy in U.S. Department of Agriculture plant hardiness zones 5 through 9. It can spread aggressively and may become invasive by sending underground rhizomes into new areas, a tendency you can control by encircling the planting area with an edging barrier that extends about 6 inches deep in the soil.